Machine-Oriented Ontology: Towards a Pan-Mechanism | Larval Subjects . The initial draft of my plenary for the Deleuze Studies conference next Tuesday. What we need is not a conception of being composed of objects, but rather of machines. Nor is it a pan-psychism, organicism, or vitalism that we need, but rather a pan-mechanism. To be is to be a machine. 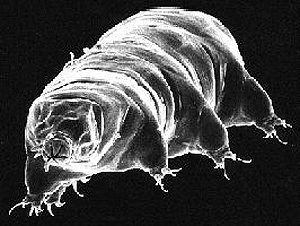 Rocks are machines, stars are machines, trees are machines, people are machines, corporations are machines, revolutionary groups are machines, tardigrades are machines And if a generalized machinism is so necessary, then this is because it brings precision to what we’re doing when we analyze substances, entities, and how things interact. Pan-mechanism is not simply the claim that being is composed entirely of machines, but that all interactions are machinic interactions. We do not yet know, of course, what this means. Clearly there is an entire zoology of machines that must be intensively investigated. Just as in zoology a mushroom is not an ardvaark and the two belong to entirely different genera, a rock is not a computer nor a mantis shrimp and automobile. Everything is a machine, yet there are very different types of machines. Most objections to the thesis of pan-mechanism will arise from treating one type of machine and machinic interaction as capturing the essence of machinism as such, ignoring the broad zoology of machines. Or rather, since “zoology” is still too vitalistic, we should instead refer to a “mechanology” composed of different genera and species of machines. Zoology studies only one genre of machines. Of course, being the perverse imp that I am– “evil” is, after all, an anagram of my name “Levi” –I have chosen the terms “pan-mechanism” and machinism not simply to mark my continuing debt to Deleuze and Guattari, but to get under the skin, to prickle, to generate some irritation and discomfort so that some thought might take place both in myself and perhaps others. Pan-mechanism is simultaneously an ontology, theory of interactions or relations, a methodology, and a very concrete empirical research project. 1) Functionalism: The dictionary tells us– at least on Google –that a machine is “an apparatus using or applying mechanical power to perform a particular task.” This definition is a fair initial step, but remains too anthropomorphic and specific to capture the essence of machines. First, mechanical energy is only one type of energy machines use to function or perform. A flower is a machine, yet it does not use mechanical energy to machine, but rather chemical processes. Institutions are machines that often have mechanical components, but primarily machine utterances and other signs. We must thus abandon the thesis that the use of mechanical power is an essential feature of machines. Mechanical power is only used by one genera of machines in the mechanosphere. 2) Heterogeneous Consistency: There is no such thing as a simple machine. Insofar as a machine is an apparatus, it is necessarily a heterogeneous consistency. The claim that a machine is a heterogeneous consistency is the claim that machines are composed by parts that have come to form some sort of consistency or interactive unity amongst themselves. There is no such thing as a machine that is not composed of parts and these parts are heterogeneous amongst themselves. For this reason every machine is a multiplicity. The heterogeneous consistency of machines therefore presents us with two questions: first we get the question that Whitehead poses in the first chapter of Process and Reality: “How is a disjunctive diversity increased by one?” That is, how do we pass from a diversity of heterogeneous entities or machines to a machine that internalizes these machines forming a new machine? This is the question of emergence. How does a new machine emerge from a plurality of machines? Take the example of a machine like a hurricane? What are the processes by which a hurricane emerges from a plurality of other machines such as particles of dust and moisture? This first question of emergence or assembly– which will differ from machine to machine –draws attention to something we can call machinic problems. In assembling a variety of other machines together to form a new machine or consistency, machines necessarily encounter problems that arise from the interaction among their parts or the other machines of which they are composed. Insofar as the parts that compose a larger-scale machine are heterogeneous amongst themselves there will be tensions between them. The machines of which a machine is composed never smoothly fit together. There are always tensions between the machines of which a machine is composed; and if the machine is to endure then these tensions must be resolved or operated upon in some way to prevent the machine from disintegrating. Machinic problems thus play a key role in how a machine develops or evolves over the course of its existence. Of course, it goes without saying that every resolution of a machinic problem generates new machinic problems or tensions, leading the machine to develop in yet new directions. Machines are perpetually becoming because of the machinic problems that haunt them. This is all rather abstract so take the example of a concrete machine or consistency like a classroom. A machine like a classroom is composed of heterogeneous machines such as the various students, the professor, the texts read, the chalk, the lighting, the desks, the architecture of the room, etc. These machines all have their own haecceities or pecularities that don’t immediately admit of consistency with one another. The students all differ from one another coming from different socio-economic backgrounds, having different skills, being different genders and sexual orientations, having different needs as in cases where they speak English as a second language or have a disability, etc. Likewise, the texts read over the course of the semester are heterogeneous from one another. If the class is to form a consistency or a machine that functions, there must be some sort of synthesis of these heterogeneities, some sort of resolution of this problematic field. These resolutions will play a role in how the class develops over the semester. Yet with each resolution, new problems will develop or emerge. It is for this reason that the future of a machine is aleatory. We never fully know how it will develop. The idea of a machinic problem does not entail that problems only exist within machines. As we’ll see, machines exist in a broader milieu or ecology that is also a broader problematic field. Second, insofar is the formation of a machine is a heterosynthesis of hetergeneous machines, it follows that machines have a sort of diagram. The diagram of a machine is the manner in which the machines of which a machine is composed are organized or related to one another in this machine that has managed to form a consistency. However, it would be a mistake to think that the diagram of the machine is like a blueprint or a structure. Rather, the diagram of a machine– its organization –is an organization of vectors of becoming or development. It is the functional unfolding of the machine as it moves through time, the vector-space of the machines becoming. 3) Flows: Machines can and mostly do function or operate. At the beginning of Anti-Oedipus Deleuze and Guattari claim that all machines are “binary machines”. By this they mean that in order to function, machines must draw flows from other machines. A machine cannot function without a flow from another machine. A mouth machine is coupled to a breast machine from which it draws flows of milk. My computer is coupled to a socket from which it draws energy. A flower is coupled to the sun from which it draws light. In those instances where a machine is uncoupled from its flow it becomes dormant, a sleeping machine. Yet it is likely that no machine is ever fully asleep insofar as machines are composed of machines, emerge from machines, that are producing flows all the time. Even when the battery is dead on my computer, the atoms and molecules of which my compter is composed are producing all sorts of flows that bring about changes and becomings in the computer. The nature of the flows matter. If I plug my computer in in France it will fry because they use a different voltage. The sort of light a plant draws on will make a difference in how the plant develops. For example, my plants often wither and die because of the intensity of the Texas sun. Machines need the right kinds of flows in order to function or do what they do. Flows are conditions of both emergence and functioning. A hurricane, for example, can’t emerge without the right flows of heat, humidity, and pressure. A theory and empiricism of flows is thus a crucial element of pan-mechanism. Flows preside over the local manifestations of machines or the qualities they produce at any point in time. A flow of light at one wavelength will cause my coffee mug to manifest itself as a bright cobalt blue, while the wavelengths of of candlelight will cause it to manifest as dark blue. The blue of my mug is the result of a machine– the mug –operating on a flow– the wavelength of light –producing a quality. Yet machines do not simply draw on flows, they also produce flows. My computer produces flows of light from its screen that, in their turn, affect my neuronal firings. Many people will be familiar with the experience of surfing the internet or writing a paper late into the evening only to find that they have difficulty falling asleep. From what I understand, the wavelengths of light affect neuronal firing patterns in such a way that it is difficult for the brain to enter those firing patterns necessary to pass into a sleeping state. Similarly, plants produce flows of oxygen and humans produce flows of garbage. As Janae Sholtz argues, a painting is a machine that draws on flows of paint, light, brushes, the artist and that produces flows of light that act on other machines in all sorts of aleatory ways producing machines such as collectives and values. Pan-mechanism calls for an entire investigation– of an empirical nature –of flows produced and how they couple to other machines. 4) Coding: In functioning and operating on flows, machines code these flows. To code is to form or rather trans-form. If it is important to emphasize that all coding is trans-coding, then this is because there is no such thing as an unformatted or unformed flow. Every flow, no matter how fluid, has some minimal structure of its own. The flows of water, sunlight, carbon-dioxide, and minerals upon which an orchid draws are not without structure or form of their own. They are formed matters. However, when the machine of the orchid machinically operates on these flows, it trans-codes them, turning them into something else. Cells and cell parts are formed. Flows of oxygen are produced, etc. Let us return to the example of the classroom. The classroom draws on flows of students and texts. Clearly texts and students have all sorts of forms of their own. They aren’t structureless oozing muck. Yet in participating in the class, both the texts, students, and professor undergo a process of coding or forming in both the lectures of the professor, the class discussions, and and the assignments. The students are formed or coded into something else. What are they trans-coded into? Perhaps they are formed into workers, or perhaps managers, or yet again they are formed into responsible citizens, or yet again into nationalistic citizens ready to die for God and country, or maybe they’re formed into academics or scientists. In each case the flows will be coded as a function of the operations unique to the machine that acts on these flows. Yet if it is so important to emphasize that flows themselves possess structure, then this is because there is never a flow that is so coded by the machine through which it passes that it leaves the machine through which it passes unchanged. There is never a flow that is completely docile. It is for this reason that machines are, as Stacy Alaimo argues, trans-corporeal. The nature of a machine is every bit as much a result of the flows that pass through it as it is the result of how it has resolved its own internal machinic properties. We are what we eat. The mercury that enters salmon both affects those salmon and is passed on to me, affecting the manner in which my body produces cells and the nature of those cells. You can test a skin sample of an unknown person and determine what region of the world they are from not through their genetics— though that too –but through the sorts of machine traces found in the flesh sample like radioactive materials, carbons specific to corn, mercury levels, etc. All machines are trans-corporeal because machines penetrate one another through flows and these flows modify the nature of the machine– even if only in sleight ways –leading them to develop in new ways. Nothing ever remains in itself, but in the functioning of machines flows are always radiated out into the world, diffracted throughout the world– a good Karen Barad world –modifying the natures of other machines. 5) Sentience: Insofar as machines must draw on flows produced by other machines to function, machines necessarily have a minimal degree of sentience. All sentience here means is that machines are minimally receptive to flows in the world about them. A machine is only selectively sensitive to flows; which is to say that machines aren’t receptive to all flows. 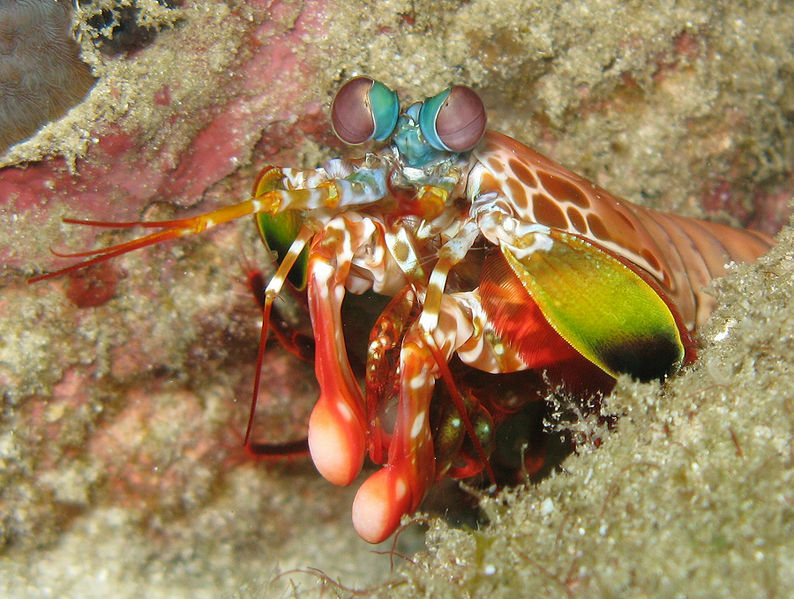 The machine of my eyes is not receptive to infrared light or x-rays, while a mantis shrimp is receptive to the sort of light we can see, ultra-violet light, and circular polarized light. Rocks with a high iron content are machines receptive to oxygen, but not neutrinos. A master pianist is receptive to differential traits of music in ways that I’m not. A bureaucracy is receptive to properly filled out forms, yet not to persuasion by the people whose lives have fallen into the orbit of the corporation. Closely related to the question of the emergence of machines from out of other machines, pan-mechanism requires an investigation both of the various forms of receptivity– a project that Ian Bogost has taken up in his Alien Phenomenology and that was also explored in the animal ethology of Uexkull –but also a theory of the emergence of new forms of receptivity. Here we encounter not an empiricism– though empiricism is required to discover the form of receptivity of a corporation or a fly (cf. Uexkull’s contrast of how we see the world versus how a fly sees the world to the right) –but also a transcendental empiricism. A transcendental empiricism is an account of the genesis and structure of the form of sensibility for a particular type of machine. For example, when Deleuze investigates the literature of Sacher-Masoch in Coldness and Cruelty, he is not telling us the meaning of Masoch’s literature, but providing us with the structure of how masochists encounter the world. That structure is different for a sadist, and different yet again for a shark. Art is, in part, a medium or fly by which we are able to encounter the structure of other worlds insofar as it transforms those experiences that would otherwise remain in the internal experience of a machine into blocks of sensation and affects that can circulate throughout the world and be apprehended by other machines. In any event, receptivity is a machine that codes a flow of a particular sort. 6) Fatigue and Fluctuation: The operations of a machine are not fixed, but are subject to all sorts of flows and fluctuations. Rigid machines are doomed, it seems, to entropic decay as they become worn out in their functioning and as a result of the flows that pass through them. The car eventually falls apart by being used. Our powers of acting continuously fluctuate. When we haven’t eaten for long periods of time or are fatigued or hungover, the receptive and productive operations of which we’re capable are diminished. In a state of insomnia words on the page blur and I’m unable to track the text. Fatigue is a real phenomenon for every machine. When I drink coffee, by contrast, I become alert and– so long as I have not overdosed on caffeine, the operations of which I am capable are enhanced and sharpened. For organic machines, there thus seems to be an elastic fluctuation of degrees of power between fatigue and optimal functioning related to the flows that pass through the machine. Yet for all machines, powers aren’t fixed once and for all, but rather powers are gained and lost. We see this clearly in the case of machines such as ourselves– learning machines –that are capable of acquiring new powers or capacities to engage in operations. I can learn how to play the piano. Through exercise, I can gain new powers to run, jump, and swim. Muscles and bones no less than brains are able to take on new powers, as well as lose them; a point that every astronaut is intimately familiar with. 7) Ecology: Insofar as machines draw on flows from other machines and produce flows that are drawn on by other machines, pan-mechanism is an ecological thought. Let us take the example of a woman sitting at her spinning wheel. This humble activity already opens onto an entire machinic ecology that nearly engulfs the world. The wheel machine, of course, can only function by drawing on flows from the woman’s foot. In the absence of these flows, the wheel is dormant or asleep. The wheel codes the chemical and intellectual flows of the movements of the woman’s foot into mechanical motion that spins the wheel. 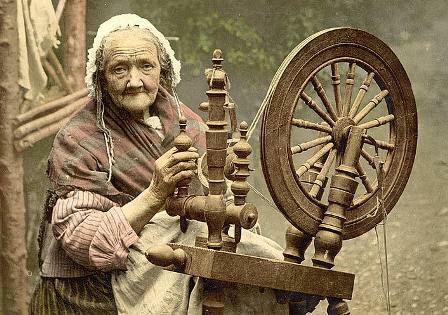 Yet the spinning wheel does not simply draw on flows from the woman’s foot, but also flows of wool that the woman and wheel code into wood or yarn. That wool, of course, had to come from sheep where farmers deterritorialized the fur through sheering it. And the sheep, in their turn, required grass, water, and oxygen that they coded or trans-formed into wool cells. All of this had to be transported to her. Yet the woman and wheel do not simply code wool into thread, the woman herself is coded in a variety of ways. In sitting at the wheel for hours on end, the wheel codes her musculature in new ways, creating new muscle and bone structures, as well as new postures. Perhaps she now stoops and walks with a limp. She was also coded by an institutional network that trained her to use these machine, imbuing in her a capacity for operations not shared by others. Perhaps, in her particular society, women who spin at wheels have a particular status as untouchable or highly regarded. These signifying codes, in their turn, affect her interpersonal relations. And finally, of course, the thread that she spins is a flow for the production of clothing and other goods that feed into a system of exchange whether capitalistic or feudalistic. Here, in this fragmented sketch of a particular pan-mechanist ecology we see how a thread literally ties together machines with natural, technological, economic, gendered, and expressive components ranging across an entire geography. Nice. But what would be the difference between pan-machinism and pan-computationalism? Medium matters in a pan-mechanism. “Ah, to be able to express myself wholly the way a motor expresses itself! Without completion, like a machine! To go through life triumphantly like a late-model auto! That’s more or less right. I’m trying to take a Spinozist route here where a machines affects or powers fluctuate. So the hangover isn’t necessarily a loss once and for all, but a diminution of our affects for that period. Gorgeous quote Gerardo. Thank you so much. (a) Are any objects not also machines? (c) Does a machine ontology require a debate about relational operators? In a more traditional context, machine relations are commonly described in hierarchical terms and, when applied to human relations, often as a synonym for oppression. I’m working on ‘Manuel DeLanda’s Aesthetics’ and was interested in your reference to Janae Sholtz and painting in the flows section above. Can you direct me to a text where she discusses this? Thank you and looking forward to your talk in Dublin in July. It’s a book project she’s working on now. Not sure if anything is published. You might consider contacting her. 2.4 million years ago (or thereabouts) a group of homonids in what we now call East Africa began making stone tools on a regular basis. Following the usage which comes to use from the Leakeys we call these choppers Oldawan pebble tools. Mary Leakey found the first of these in Oldavai gorge sometime in the 1950s, if memory serves. The curious thing about the toold she found that day was that the stone was not from the gorge but rather from outside the gorge some 3 miles away. Some homonid had made the tool itself in the gorge, however. This shows (1) a degree of foresight as not all rock keeps an edge and (2) the rock was found, recognized and transported elsewhere before being worked. The usual Darwinian explanation of things holds that the creatures that could make such tools obtained thereby a competitive advantage over other creatures who could not do so. This makes sense, but it also obscures a point, which per G. Bateson (Mind and Nature of 1979), I’m going to call Lamarckian, in that (1) the action of that homonid showed desire and intent, (2) the continuing of the tradition required learning (or at least some sort of copying) and (3) this use of stone tools eventuated in a kind of change in anatomical structure. Chimpanzees and Bonobos (our two closest relatives) have what are called capacious guts. Their intestines are very large and thereby well adapted to digesting lots and lots of raw and (by current human standards. see Wrangham’s Catching Fire) not particularly pleasant vegetable matter. The same was true of the Australopithicines,a matter seen in the relation between ribs and pelvis. Within a geologically short period of time, the descendants of these stone tool makes had increasing short cuts and the correspondingly smaller rib cages associated with meat eating. They were probably scavengers more than hunters. More than thet, they probably engaged in prey theft, meaning they would take up branchs or such like and rush a carcass (sp?) driving off other creatures just long enough to slice of some meat and then runaway. Louis Leakey tried such as an elderly man, so this is doable. Approximately 600,000 years after the advent of stone tools, certain hminids underwent a rapid expansion in brain size (and presumably complexity) relative to body size. Wrangham has suggested this has to do with the advent of cooking. His hypothesis is ingenious, but so far just a hypothesis; Lew Binford, for eaxmple has said he will not accept evidence of control of fire without evidence of a hearth (those appear @700,00 years ago or thereabouts). Note, however, that Wrangham’s hypothesis requires initially the observation that roots, animals etc heated by wild fires are sweeter and more palatable. Viewed this way, tools (or what I might call proper machines as opposed to Levi’s machines) are in McLuhan’s sort of terminology media–responses to itches. We are now surrounded by such media. In that we have yet to devise a Turing machine, all proper machines differ from living organisms in several important ways, for example various degrees of self organizing (my beand climb up their stakes, the sunflowers turn with the sun, the kittens come and ask to be let in for food etc) and from climates in varing degrees of multiplexity (see A Tsing Friction on scaling in model making). There are various anomalies which show up in the more recent records of these sorts of proper machines. The ancient Maya built their tremendous cities in the rain forest without as far as we can tell the use of wheels. The usual sort of explanation for this has been that they lacked beats of burden, but I demure in that they used the beast of burden of last resort, human beings, to shift all that rock, build those resevoirs and keep all that agriculture going (see Demerest Ancient Maya). Demerest points out that the maya mimiced the rain forest to produce the necessary agricultural surplus, some thing modern westerners have shown themselves so far no more likely to do than we would easily grasp the principles of Balinese water mountain irigation (see Lansing Perfect Order). The Khmer also developed a rain forest civilization with a very, very large city at Angkor Wat. This city was in part possible because the Khmer found ways to adapt to the way the Mekong flows to the sea half the year and backs up into the Tonle Sap, a large inland lake, the other half of the year (see Michael Coe, unfortunately I do not have copy with me and do not remember the title). As an aside, one can recognize the difference between Khmer and say, Vietnames by the way they build their houses and the way the handle water. Given the fluid, very fluid nature of so-called ethniocity all across SEAsia, this is not unimportant. In the late 1st or early 2nd century BCE somebdy in Alexandria developed a steam engine. They did not apply this machine to the loom or to drawing water out of mines (Watt’s initial use for the steam engine). The usual explanation is that the Roman etc had a society based on slavery, but the Britain of the mid 1700s was a part of the great Atlantic trade which involved among other things, slavery. Whne Captain Cook arrived in Tahiti, the locals sailed out to meet the stranger ship. They circled his boat as it entered the harbor. Most accounts of this encounter neglect to point out that the Tahitian catamarans were no only faster but also larger than Cook’s ship. Some years ago I pointed out on this blog that these same Austronesian people occupied every rock which would sustain life (and some without their own supply of fresh water) in the Pacific prior to the coming of the Europeans. I also pointed out that they were quite capable of sailing no only from Tahiti to Hawaii (by Hawaiian tradition initially by following a shark) but also returning to Tahiti (by moving the stars). Yes, by moving the stars, but then they knew and now still sometimes know which star follows which across the sky and thus remain capable of remaining at the center of the world and moving the world around them. They do not navigate blindly. I know that Levi is sympathetic to the construction point embedded in the four previous paragraphs. I appreciate that. I want to draw a slightly different conclusion, as I find myself not all that satisfied by Levi’s machines. Partly, this is because I find the image of the machine much more important in western (Euro-American) metaphysics than elsewhere (and not always in a nice way, see Adas Machines as the Measure of Men). But also because I found myself thinking about Indonesian verbs as I read his post. English is rather fuzzy in certain ways that Indonesian is not. Indonesian verbs distinguish what I will call process (where we are not interested particularly in who did what) from intentional or morally complicit behaviour. This axis is cross cut by another axis which distinguished active from passive, and not just in verbs and not just with thye activity flowing one way. Belajar refers to the process of learning while mengajar (active) and diajarkan (passive) refer to the activity of teaching. Terbunuh meand killed (presumably by accident as we are not interested in culpability) while membunuh (active) and dibunuhkan (passive means killed and in a morally culpable way, so perhaps murdered or sacrificed). There are also a set of verby nouns (anak or child for example or kemerdekan or freedome where one is struck by freedom, the agent of your emiseration, as the linguists would put it being G-d). There are also a set of verbs whch combine active and passive (tawar menawar meaning to bargain or pukul memukul meanin to hit one another). Spirits, understood as forces inside nature, can act. Machines can not. The car does not drive itself because it cannot start itself. Thinking this way, Levi’s woman working at her spinning wheel bends herself to the intransigence of the spinning wheel because she wants to produce thread (something she could do other ways) and Levi’s neurology responds to the workings of his computer not because the computer turned itself on but because he did. Its not that working with proper machines does not have reciprocal affects upon the users thereof, its that the users endure these affects because they are scratching an itch. an itch which entangles them in a world not entirely (or even mostly) of their own devising, witness the monsoons which back the Mekong into the Tonle Sap, flooding large areas of previously dry land before the floods recede and the Mekong flows towards the sea once again. Another way of putting this might be to call proper machines faux animals and faux plants; Turing machines might well turn out to be something rather different. So I return to my previous question. Wouldn’t the discussion of these matters be more interesting if phrased in terms of strange collectors rather than machines? I believe thinkers always need to find their own words. Thus, while I have no problem with “strange collectors”, it’s just not a word for me at this time. There are a couple of reasons for my choice of machines. On the one hand, I think the machine concept, as I develop it here, brings precision to thought and inquiry (at least for me). Your wonderful response to my post, for example, strikes me as a hominid history of machinic codings that both changed us and other things (the tool, interface especially; McCluhan is a hugely important thinker for me and Bogost and I are currently writing a book on him). Second, I wish to underscore the omnipresence of the machine in the anthropocene, drawing obsessive focus away from the semiotic and meaning in the humanities (without abandoning either; just blunting their imperialism). Finally, third, machine evokes thoughts about raging against the machine and workers struggles against technologies that deskill them and turn them into machine parts. I have an article soon coming out in Umbr(a) that talks about technologies as having now become animals of sorts that no longer serve at hominid behest and all the problems that follow from this newly emerging form of life. At any rate, for me machine language better gets at the processual nature of things and all their nuts and bolts than the concept of strange collectors. Love your points about Indonesian language. However, lest we fall into something like Heidegger’s racist view that only German and Greek are appropriate languages for thinking being, I think its also important to remember that every language is just a particular machine interface for coding (forming) features of the world without toatlizing or capturing the being of the world. I am unlikely to fall into that particular problem of Heidegger’s, at least at the moment I think so. I speak bits and pieces of 20 or so languages. Sometimes they blur on me. That is I think in English but with Indonesian grammar very much in mind or vice versa. In any case, I am not making any claims of the sort that this or that language is the only one appropriate to think in; I agree with your use of the word racist. I am only suggesting per Whorf lite that some languages make thinking some things easier than others. English passive are notably obscure, for example. I am happy to let thinkers think in whatever words they find useful. I suppose I am saying I do not find the word machine useful, and for pretty much the sorts of reasons you give for its being useful. I think the metaphor obscures, at least when we discuss what I called proper machines. I would be interested to see what you make of an encounter with chaos theory. I’ve been meaning to read Kauffman’s The Origins of Order ever since it came out, but I fear sometimes the maths is beyond me. Perhaps you would do better. For the moment, consider this a friendly dissent. One minor point. Tool use on this planet is not solely human. Nor are we the only ones who use tools to make tools. We just do so at orders of mangnitude greater than others. Would love to! I’m not back in town until the 7th of July. Heading off to England this afternoon for three more talks. Just spent nine days in New Orleans where I gave four talks. Exhaustion! As for word choice, I like prickly words that get under people’s skin. I suppose there’s a bit of my Lacanian background here. A good Lacanian “interpretation”– Lacanians don’t really interpret, they act through words –is one that interrupts the unity of the analysand’s discourse, its intended meaning, allowing for other meanings, materials, and the discourse of the unconscious to come to light. I think good philosophical language is not so much language that transparently communicates meaning, but that startles and thereby awakes us from our dogmatic slumbers or unconscious disciplinary assumptions. “Wait, what, did he just say everything is an object, even people? Wait, did she just say everything is a machine, even flowers, stars, and corporations?!?! ?” The aim is to break up the sedimentations of discourse so that things can be seen anew. This is the influence of Deleuze on me, as well. For Deleuze we never think of our own accord, but only involuntarily under the effect of what he calls a “sentiendum” or an encounter that forces us to think. Between you and me– don’t tell anyone else –I don’t really have an ontology. I have a set of aesthetic and ethico-politico commitments and projects in search of vocabularies and encounters with other forms of thought. Those commitments tend to remain the same, while the ontological schemes vary. And when I say that, of course, I’m not saying I want to take anyone else’s experience of the sacred away from them or fight against it. It’s just not for me, is all. Ok, one pedagogical anarchist to another, I’ll buy that. As you will know, I do tend to be more friendly to spiritualizing these things. But then I don’t seem to think that the spiritual involves any commitment to a supernatural….I have strong Siwite and Buddhist tendencies after living so long with Balinese notions. I really liked today’s post by the way. I had many similar experiences, albeit with reefs and those that live on them, Seeing a shark in the water or barracuda go by produces a fine sense of awe. Have a good trip. See you when you get back.